The SavOxCap 60 is an Oxygen Self Rescuer class K60 with hood, which provides the user with breathing air for more than 60 minutes, independent of the ambient atmosphere. Based on the world wide proven KO2 technology of the SSR 90/K60 the SavOxCap 60 offers, in addition, protection for the eyes and head. 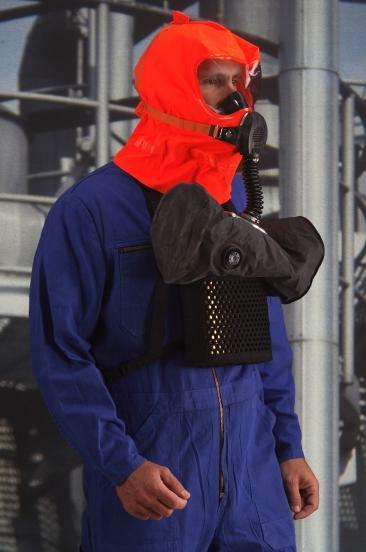 The clearly visible orange hood features a large flexible visor and an integrated half mask with speech diaphragm. The SavOxCap 60 is EC-type certified in conformance with the Council Directive 89/686/EEC. It has been tested and approved on the basis of the standards EN 13794 and DIN 58639.